The Winnipeg Foundation was established in 1921, the first community foundation in Canada, with an initial donation of $100,000 from William Forbes Alloway. He saw the creation of the Foundation as a way to give back to his community. On his death in 1930, his entire estate was left to the Foundation along with that of his wife, Elizabeth Maclaren Alloway, providing a total endowment of some $2 million. It has since grown to be one of the largest community foundations in North America. 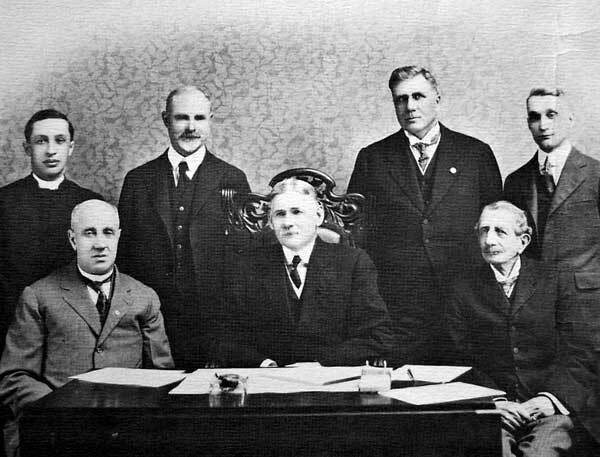 First Advisory Board and Staff of the Winnipeg Foundation, 1921. Left to right: R. B. McElheran, E. Parnell, C. P. Wilson (Solicitor), T. G. Mathers, R. M. Dennistoun, H. J. Macdonald, and P. Lowe (Secretary). Source: Archives of Manitoba, Dennistoun Diaries. Photograph of the first Advisory Board of the Winnipeg Foundation, Diaries of R. M. Dennistoun, Archives of Manitoba. “Alloway wills all to local charities,” Manitoba Free Press, 27 February 1930, page 10.